Wow. It’s been some kinda forever since I actually made a for-really-real post here… you know, a non-lying post. If you’re one of the 3 people checking this site to see something like that, I apologize. Of course, if you’d rather I shut up and just do the lies… pppphhhhbbbbbtttt! I have a good reason for not posting more often. I’ve been writing a book. 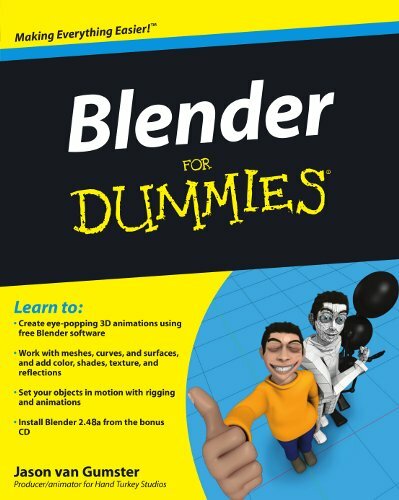 Specifically, I finished writing Blender For Dummies about a month ago. Woohoo! Now, for those of you who don’t know, Blender is a free and open source program for creating 3D animations and it’s what I use on a daily basis for the work I do. It’s totally sweet and definitely worth playing with. This entry was posted on Wednesday, December 3rd, 2008 at 9:46 am	and is filed under Blender, Computers/Tech. You can follow any responses to this entry through the RSS 2.0 feed. You can leave a response, or trackback from your own site.